An evolution of the EA117, our Charles Eames EA119 Office Chair has a high back to make it even more supportive and distinctive. Made from luxurious premium leather, the seat gently conforms to the shape of the body to create a firm comfortable seat, suitable for everyday use. The 5-star base is made from polished aluminium and has wheels to ease mobility. The Eames 119 Office Chair is part of a family of chairs designed by Charles and Ray Eames in 1958, called the Aluminium Group. 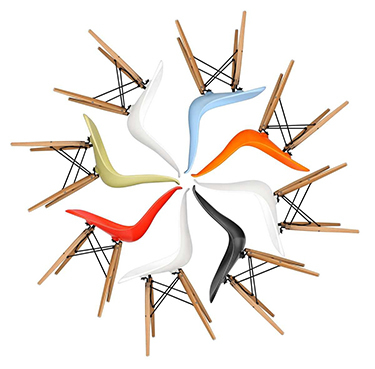 The original idea for the chair came about after Charles and Ray Eames were issued a design challenge by Eero Saarinen and Alexander Girard. Saarinen and Girard asked Charles and Ray to design a high quality chair for outside use. The prototype was made from a mesh material but was later replaced with leather to become the Charles Eames EA 108 Office Chair. It was then further developed to become the Charles Eames EA 117 Office Chair and then the Charles Eames EA 119 Office Chair.